In 1998, at the height of gang related murders in the city of Boston, Jameel Parker was commissioned to paint a mural by Gang Peace, a not-for-profit, street-based programme seeking to reduce the number of murders in Boston by redirecting youths into education and career-oriented activities. In 1992, around 600 local youths between the ages of 8 and 23 participated in Gang Peace programmes. 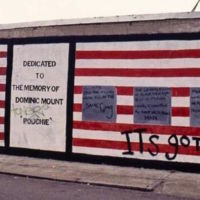 Parker’s mural, titled All in the Same Gang, was painted in Boston and became a monument to those who had died as a result of gang crime. During its creation, on the corner of the street where the mural was painted – Blue Hill Avenue and Floyd Street – a young boy named Dominic Mount was murdered. Given the immediate community outcry following his death, Parker dedicated the mural to Mount and placed his name alongside heroes of Black history; Frederick Douglass, W.E.B. Du Bois, Malcolm X and Elijah Muhammad. By 2016, the portraits of the African American male leaders had faded and the mural had changed to now include four black women, includng abolitionist Harriet Tubman.